Andy Rubin, the co-founder of Android, today released his latest smartphone under his new company Essential, with the phone being called Essential Phone. Unlike other smartphones in the market, the Essential Phone is a bold and modular smartphone in many ways. Keeping in line with the bezel-less trend, the Essential Phone also features a 5.71-inch QHD 19:10 aspect ratio edge-to-edge display which is even better than the Galaxy S8 as the top bezel is almost non-existent and the display actually wraps around the selfie camera. As if the display was not already impressive enough, the Essential Phone is made from titanium and ceramic that allows it to survive drops “without blemish” showing up. This automatically makes the phone better than Samsung’s Galaxy S8 and the upcoming iPhone 8, both of which are made of glass which is prone to shatter when dropped. Inside the Essential Phone is a Snapdragon 835 chipset, 4GB RAM, and 128GB of storage space. There is a dual camera setup at the rear, with the secondary sensor being monochrome in nature that allows it to absorb more light. The primary camera features a 13MP f/1.85 sensor. There is an 8MP selfie shooter at the front. There is also a fingerprint scanner at the rear of the device, with a USB-C connector and a bottom firing mono speaker at the bottom. Sadly, the handset lacks a 3.5mm audio jack, though Essential is hoping to make up for it by including an adapter in the box. On the software front, the Essential Phone runs on Android 7.1.1 Nougat with no bloatware thrown in. The rear of the Essential Phone features two metal pins that act as a connector for the modular accessories that Essential will be offering for the phone. Similar to Moto’s approach, accessories can be attached to the back of the Essential Phone thereby giving it a modular nature. 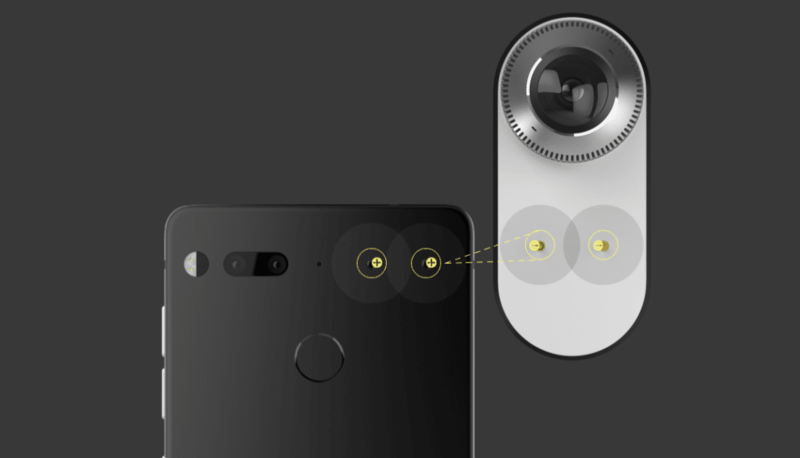 For now, Essential is launching a 360-degree camera accessory for the smartphone which it is calling the world’s smallest 360-degree camera. The Essential Phone will only be available in the United States for $699. It will be available in four colors: Black Moon, Stellar Grey, Pure White, and Ocean Depths. The shipping date of the handset is not yet known, but the black and grey variant of the handset is already up for pre-order on the company’s website.